Dasyn joined 47th Design Festa, which was held on May 12 to 13 at Tokyo Big Sight. 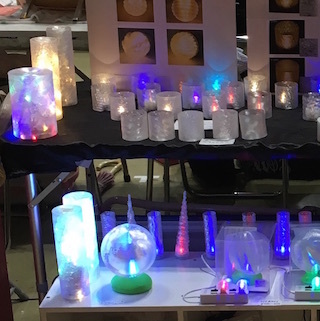 Main focus in this time was LED candle pots and table stands using 3D-printed transparent plastic (PLA) with very fine moaré patterns. These patterns are generated by combining three waves at design time. These waves are mapped to print head motion; that is, the first two are generated by shaking the 3D print head vertically and the third wave is generated by shaking the head horizontally.